The doctrine of correspondence is central in Swedenborg's philosophy and in New Church philosophy as developed from his theological works. This is well-known. The subject has been the focus of inquiry in articles published in The New Philosophy as well as in New Church collateral literature for a period of more than a century. In addition, it is perhaps the most widely known Swedenborgian doctrine, not only through Swedenborg's own works, but also through its appearance in works of others such as Blake, Coleridge, and Emerson. It is our intention now to show its application in photosynthesis, that chemical process whereby water and carbon dioxide are combined to form carbohydrate by means of the catalytic action of chlorophyll and the essential input of solar energy. This carbohydrate is the raw material from which food for living organisms is produced by complex biochemical pathways in plant cells. Then, in plant and animal respiration, the solar energy stored in food is released to enable the organism to live. We, therefore, owe our physical being on earth to photosynthesis, and we hope to show that we owe as well our spiritual humanity to its spiritual counterpart. To accomplish this we need materials of thought ranging from philosophic principles to scientific knowledge. This article, therefore, is presented within a framework that consists of the following: some basic philosophic principles; reference to leaves and trees in the Word; environmental factors in plant growth; leaves; photosynthesis; and the correspondence of photosynthesis and tree growth. The ideas that follow are presented without elaboration or detailed documentation. They are fundamental to the New Church philosophy of man and nature as found in the theological works of Swedenborg, to which some reference is given as the source of these ideas. 1. In the Genesis account of the creation, man is called "an image" and "a likeness" of God, the former signifying that he is a receptacle of life from the Only Source of Life, God; and the latter, that he has the appearance of self-life (see TCR 46; AC 2520). Hence God acts and man can react. 2. The spiritual world is not something removed, not a place that one "enters" after the death of the body, but is an ever present, immanent reality. Thought and emotion are manifestations of its constant presence and are indeed spiritual phenomena, and the existence of material substance is likewise dependent on its constant creative and sustaining power. 3. Ideas have a spiritual origin (see AC 2471, 10237), and ultimately have their source in God. Despite this, however, their existence with men is dependent on their association with sense impressions; for ideas to have permanence, they must be founded in these. 4. There is a material reality outside of us, a reality whose existence can be known beyond what Berkelian idealism would have us believe—that "to be [of an object] is to be perceived." The application of the doctrine of correspondences to thought about the material requires that what we know about the world (as expressed in that body of theory called science) bears at least some resemblance to the way things in reality are. 5. "Correspondence" (co-respondence) refers to the necessary and dynamic interrelationship that exists between the material and the spiritual planes of existence. With man, mind-body interaction is by means of correspondence, and the existence and dynamics of everything else in creation involves it also. Hence nature is, in its minutest details, an image of the Divine Creator, and derivatively, of man (DLW 59). The reason why influx is signified [by budding] is that when man is being reborn, spiritual life flows into him, exactly as when a tree is budding, its life flows in through the heat of the sun. He who is born a man is, in the Word, occasionally compared to the subjects of the vegetable kingdom, especially to trees; and this is because the whole of the vegetable kingdom, as well as the animal kingdom, represents such things as are in man.... Hence the ancients called man a microcosm .... [T]he man who is being reborn begins like a tree from seed (and therefore the truth which is from good is signified by 'seed7 in the Word); and also like a tree he produces such things as are of intelligence, which in the Word are signified by 'leaves/ then such things as are of wisdom, which are signified by 'blossoms/ and finally such things as are of life,... which in the Word are signified by 'fruits.' Such is the representative likeness between the fruit-bearing tree and the man who is being regenerated; [and this to such an extent] that if anything is known about spiritual good and truth, the nature of regeneration may be learned from a tree. Among the many references to trees and leaves in the Word, we note particularly that they feature prominently in association with those parts of the Old and New Testament Word that treat of the successive rise and fall of churches which punctuates human history.1 In Genesis we read of the tree of life in the Garden of Eden; in Exodus, of Moses being found in a basket made of bulrushes, slime and pitch2, and later, of the Lord appearing to him in a burning bush. In Luke we learn of the Creator's birth into the world, and of His being placed in a manger, where animals feed on products of plant growth; of His entry into Jerusalem when palm fronds were placed before Him; and of His causing a fig tree—signifying a church in which the Word of God had been falsified—to wither because it had no fruit. And finally, in Revelation, we read of the tree of life again, now in the holy city New Jerusalem, whose leaves would be for the healing of the nations. And we note also that in Psalm 1 man is likened to a tree planted by the rivers of water whose leaf shall not wither, while in that most loved of Psalms we are led to green pastures. The Word is like a garden, a heavenly paradise, that contains delicacies and delights of every kind, delicacies in its fruits, and delights in its flowers; and in the midst of the garden, trees of life with fountains of living water near them, while forest trees surround it. Two aspects of the environment need emphasis here. Firstly, regarding the role of soil, we note that in addition to supplying a matrix in which root growth can occur, thereby providing anchorage for the plant, the clay colloidal particles serve as a reservoir of plant nutrients, which in ionic form are attached to the electrically charged surface of the clay colloids. Then, and more importantly, soil moisture with dissolved nutrients enters the plant via the root system, providing one of the two essential ingredients of photosynthesis—water. Secondly, regarding the atmosphere, two aspects of its role in plant growth deserve attention. The first is that it is from the atmosphere that carbon dioxide enters the plant via the stomates (little mouths) on the underside of the leaf; the second is that it engages in important interreactions with incoming solar radiation. Both of these roles will be addressed shortly. Beyond its function in photosynthesis solar radiation provides the energy for atmospheric and oceanic dynamics, and together with the force of gravity, is responsible for molding the continents into their myriad landscapes. The reflective contemplation of nature cannot but stir in us a sense of amazement and wonder.3 Mankind's response to nature is found in prehistoric cave paintings, in ancient manuscripts from the near and far east, in classical Greek literature, and more recently in poetry and prose and through the medium of audio-visual technology. But of all the incredible things we find there, the leaf must rank among the most significant, because in its tiny cells that miracle of creation of carbohydrate takes place, providing the main raw material for the development of living systems. To help focus our attention on it, Figure 1 provides illustration of leaf structure. And to emphasize the significance of photosynthesis, Figure 2 shows the percentages of selected elements in plant and animal tissue, and for comparison, in the outermost layer of the earth termed the crust. Note that oxygen, carbon and hydrogen fixed by photosynthesis, and oxygen and hydrogen as water, account for 98% of corn plant weight, and 93% of the body weight of man. Fig. 1. (a) Section of a privet leaf. The dots in the cells represent chloroplasts which contain chlorophyll, (b) Three dimensional diagram of a leaf. Reproduced, with the permission of the BSCS of the Colorado College (Colorado Springs), from High School Biology, BSCS Green Version, 1st ed., Rand McNally, Chicago, 1963; (a) p. 426, (b) p. 432. Fig. 2. Weight percent of selected elements in the earth's crust, in a corn plant, and in man. Adapted from High School Biology, op. cit.,p. 11. The molecules that comprise most of each are: the crust, aluminosili-cates; the corn plant, cellulose and water; man, protein and water. 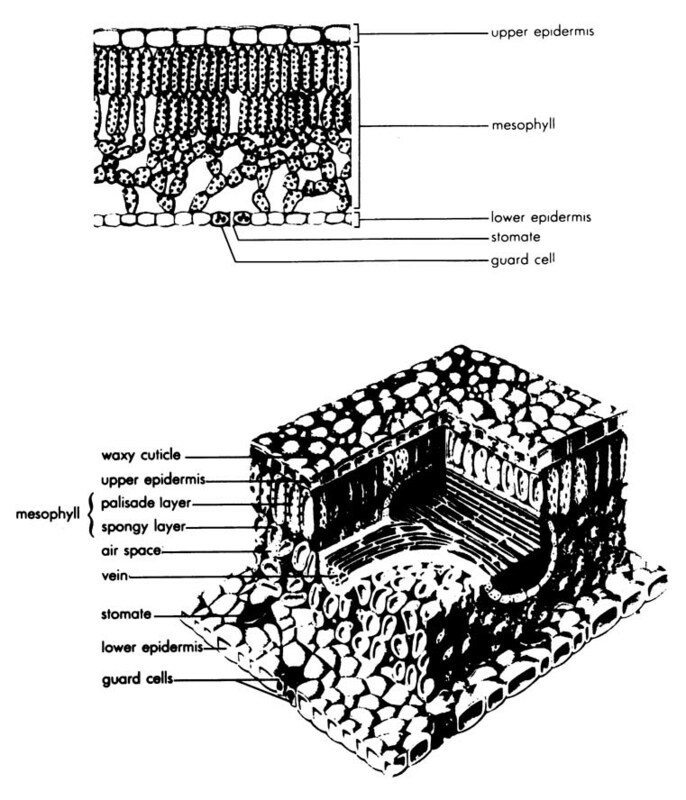 In regard to photosynthesis in the leaf, in summary, water enters into it through the vascular bundles that pipe water from the roots, air enters through the stomates, filling the spaces between the cells, while sunlight passes into the cell through the translucent cellular tissues that comprises the upper and lower skins of the leaf and the cell walls. Thereby are the ingredients assembled for the miracle to occur. The process is a two stage affair. In the first, light energy is absorbed by chlorophyll, resulting in the ejection from the chlorophyll molecule (see Fig. 3) of an energetic electron which imparts its energy to other chemical species already present, and stimulates chemical reactions. These (the so-called "light reaction") produce compounds which prepare the way for the second stage in the process in which the newly formed energetic compounds react with carbon dioxide and water to produce the all-important plant food-carbohydrates—in the so-called "dark reaction" part of the process. The electron carrying the solar energy can then return to the chlorophyll molecule whence it came. Fig. 3. Structural formula of chlorophyll a. Reproduced, with the permission of the BSCS, from High School Biology, op. cit., p. 416. Three things should be emphasized here. 1. The water necessary for the process has its source in the soil or other matrix in which the plant is growing (water itself in the case of algae growing in a pond, for example). 2. The carbon dioxide has its origin in the atmosphere; and 3. Chlorophyll acts as the essential conjunctive agent because it is capable of photo-excitement by the sun and can thereby become an electron source. Can we see in all this an image of some aspect of our humanity? Consider first the context of the growth of a tree. The tree itself is rooted in the solid earth from whence it draws in water. At the same time, it spends the course of its existence in the atmospheric environment, breathing in the atmospheric gases from which it abstracts carbon dioxide, and receiving the life-producing radiant energy from its extra-terrestrial source. Thinking now in terms of correspondences and of man as represented by a tree, we suggest that its being rooted in the earth corresponds to man's necessary first existence in the world of nature, from which he draws in sense impressions as a tree draws in water from the earth. Since the influence of the spiritual world on men on earth is through the affections and derivative thought of the spirits present with men, it seems reasonable to equate the spiritual world itself as an encompassing sphere with the natural atmosphere which encompasses trees in the course of their life. What then of photosynthesis? In that natural process, the essential result is the growth of the tree. In its spiritual counterpart the essential result is the growth of the mind. To what in the mind's growth does the natural process answer? It is a universal principle of New Church philosophy that anything substantial is the product of conjunction of something that has the quality of love with something that has the quality of wisdom. So we find many triads in revelation: Father, Son and Holy Spirit; love, wisdom and use; affection, thought and speech (or action). Now photosynthesis describes for us the conjunction of the elements hydrogen and oxygen from water obtained from the earth, with carbon from atmospheric carbon dioxide. This conjunction is made possible by solar energy, with chlorophyll serving as a means, through the provision of energetic electrons. And the product of this is food that permits the growth of the tree. By correspondential analogy, the input of solar radiation is clearly the influx of spiritual heat and light that proceeds as one from the spiritual sun. This sun is the first proceeding of the Divine Love and Wisdom, and the radiant spiritual heat and light from it "decrease" (DLW 94)5 so that men in this and the spiritual world can receive it, in much the same way that the natural sun's radiation is accommodated for living things on earth both by the sun's great distance from the earth and by what happens to it in its passage through our atmosphere. With this love from the Lord present with men, sense impressions from the natural world (water from the soil with trees) can be conjoined with influx from the spiritual world (carbon dioxide drawn from the atmosphere) to bring about the creation of knowledge (carbohydrate produced in photosynthesis), this serving as the raw material out of which the mind grows, as a tree does from the products of photosynthesis. And herein lies the basis of our humanity—in the creation of knowledge and of the human mind thereby. This attempt to apply the doctrine of correspondences to an aspect of nature follows other recent efforts along these lines published in this journal7. What purposes does this kind of thinking serve? We suggest two. First, thinking from correspondences may provide a new frame of thought from which to think about the world and its workings, thereby providing new hypotheses to serve as the starting points for the scientific study of nature. The author wishes to thank Prof. E. Bruce Glenn, Rev. Willard L. D. Heinrichs, and Dr. Grant R. Doering for their helpful critical commentaries on early drafts of the article. 1 For a recent treatment of history that involves these churches, see Erik E. Sandstrom's 'Towards a Universal Chronology,' New Philosophy 86:4:170-195, 1983. 2 All of these are composed of substances that were derived originally from products of photosynthesis. 3 See Philosophical Notes by Edward F. Alien and the article "Order" by Walter E. Orthwein in this issue in which there is reference to this kind of emotional response to nature. 4 For accounts of the influence of the spiritual world on men, see Swedenborg's Heaven and Hell, and Hugo. Lj. Odhner's Spirits and Men, Academy of the New Church, Bryn Athyn, PA, 1957. 5 See DLW 93-102 for an account of this sun and its influence. 6 Willard D. Pendleton, Education For Use, Academy of the New Church, Bryn Athyn, PA, 1985, pp. 143-144. 7 For example, most recently, Linda S. Odhner, "Correspondences of the Developing Human Form," New Philosophy 88:1:447-471, 88:2:487-504, 1985. 8 Reginald L. Cook (Ed. ), Ralph Waldo Emerson, Selected Prose ami Poetry, Holt, Rinehart and Winston, New York, 1950, p. 21.